[143 Pages Report] flue gas treatment systems market was valued at USD 50.81 Billion in 2016 and is projected to reach USD 69.11 Billion by 2022, at a CAGR of 5.3% during the forecast period from 2017 to 2022. In this study, 2016 has been considered as the base year while the forecast period that has been considered is from 2017 to 2022. 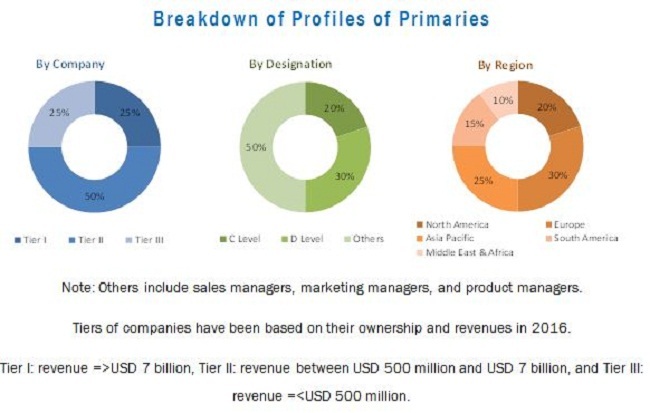 The main objective of this study is to define, describe, and forecast the flue gas treatment systems market based on business type, pollutant control system, end-use industry, and region. In this report, the flue gas treatment systems market has been studied in North America, Europe, Asia Pacific, the Middle East & Africa, and South America. 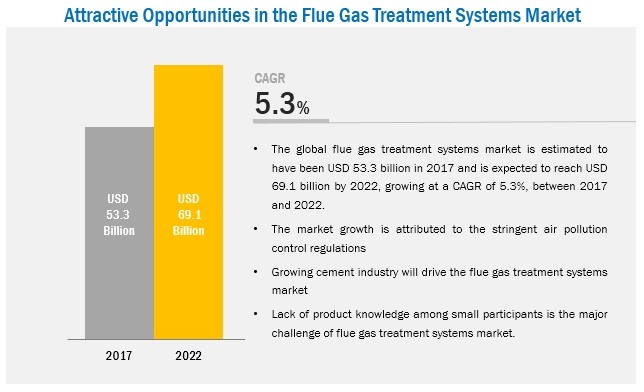 The report includes detailed information about major factors such as drivers, opportunities, restraints, and industry-specific challenges influencing the growth of the flue gas treatment systems market across the globe. The report strategically analyzes market segments with respect to individual growth trends, future growth prospects, and contribution to the overall flue gas treatment systems market. In this report, the size of the flue gas treatment systems market and its different segments has been derived from various research methodologies. In the secondary research process, different sources have been referred to identify and collect information for this study on the flue gas treatment systems market. These secondary sources include annual reports, press releases, and investor presentations of companies; associations such as the British Lime Association, the European Commission, the Ministry of Environmental Protection of different countries; and white papers, certified publications, and articles from recognized authors. In the primary research process, sources from both, supply- and demand-side have been interviewed to obtain qualitative and quantitative information regarding the flue gas treatment systems market. Both, bottom-up and top-down approaches have been used to estimate the market size, in terms of value. 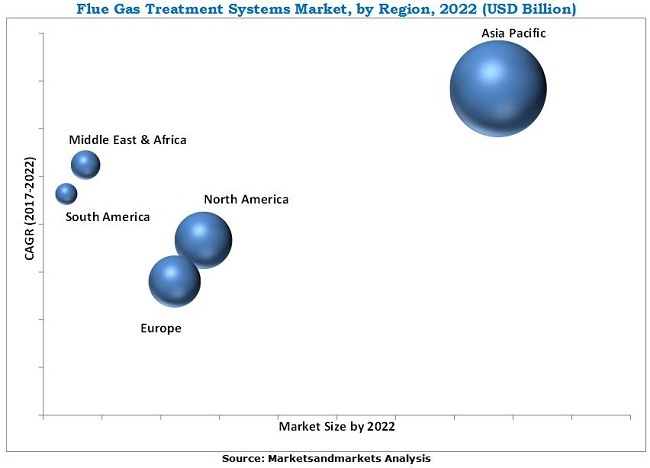 With the data triangulation procedure and validation of data through primaries, the exact sizes of the overall parent market and individual markets have been determined and confirmed in this study on the flue gas treatment systems market. The figure below illustrates the breakdown of profiles of primaries. The flue gas treatment systems market includes raw material suppliers, manufacturers of flue gas treatment systems, and end users. General Electric (US), Babcock & Wilcox Enterprises, Inc. (US), Doosan Lentjes (Germany), Mitsubishi Hitachi Power Systems, Ltd. (Japan), FLSmidth (Denmark), and Thermax Limited (India) are the leading players operating in the flue gas treatment systems market. The flue gas treatment systems market in each region has been further studied for the respective key countries. The flue gas treatment systems market is projected to reach USD 69.11 Billion by 2022, at a CAGR of 5.3% from 2017 to 2022. Flue gas treatment systems are used in a wide range of end-use industries such as power, cement, iron & steel, non-ferrous metal, and chemical & petrochemical, among others as they control emissions of various types of pollutants such as sulfur oxide, nitrogen oxide, fly ash, acidic gases, and volatile organic compounds that cause air pollution. Growing number of infrastructure development projects in various emerging economies such as India, China, and Thailand have led to increased demand for cement, thereby leading to its increased production. This increased production of cement is expected to fuel the growth of the flue gas treatment systems market during the forecast period. Based on pollutant control system, the particulate control segment accounted for the largest share of the flue gas treatment systems market in 2016. This segment of the market is expected to continue its dominance during the forecast period as well. The growth of the particulate control segment of the flue gas treatment systems market can be attributed to the increased consumption of electrostatic precipitators and bag filters in various end-use industries such as power, cement, iron & steel, non-ferrous metal, and chemical & petrochemical, among others to control the particulate matter generated by them. The mercury control segment of the flue gas treatment systems market is projected to grow at highest CAGR during the forecast period. Installation of different systems to control mercury emissions in various countries such as the US, India, and China are also expected to boost the growth of the flue gas treatment systems market during the forecast period. Among end-use industries, the power segment is projected to lead the flue gas treatment systems market during the forecast period. The growth of this segment of the market can be attributed to rising number of coal-based power plants in various countries such as China, Japan, Poland, and India and increasing adherence to environmental regulations by various industries. Based on business type, the system segment is projected to lead the flue gas treatment systems market during the forecast period. The growth of this segment of the market can be attributed to the increasing installation of new flue gas treatment systems and upgrading the existing ones in various end-use industries. The Asia Pacific region is the largest market for flue gas treatment systems across the globe. The growth of the Asia Pacific flue gas treatment systems market can be attributed to the large industrial base in the region and increased demand for flue gas treatment systems from the cement and power industries of the region. In addition, several initiatives undertaken by governments of different countries of the Asia Pacific region to attract investments from various international companies are also expected to propel the growth of the Asia Pacific flue gas treatment systems market during the forecast period. Lack of product knowledge among small manufacturers is a major challenge for the growth of the flue gas treatment systems market during the forecast period. General Electric (US), Babcock & Wilcox Enterprises, Inc. (US), Doosan Lentjes (Germany), Mitsubishi Hitachi Power Systems, Ltd. (Japan), FLSmidth (Denmark), and Thermax Limited (India) are the key players operating in the flue gas treatment systems market. These companies have adopted various organic as well as inorganic growth strategies between 2015 and 2017 to strengthen their position in the flue gas treatment systems market. The strategy of contracts & agreements was among the key growth strategies adopted by these leading market players to enhance their regional presence and meet the growing demand for flue gas treatment systems from emerging economies. 12.11.3 Burns & Mcdonnell, Inc.